Summary: Learn how to do this 20 minute HIIT workout no matter where you’re at. HIIT workouts, or high intensity interval workouts, are a great way to get a serious calorie burn that lasts all day long without having to spend a long time in the gym or on the treadmill. The moves also tend to use plyometrics, which are jumping moves that not only improve your cardiovascular health, but build muscle as well. 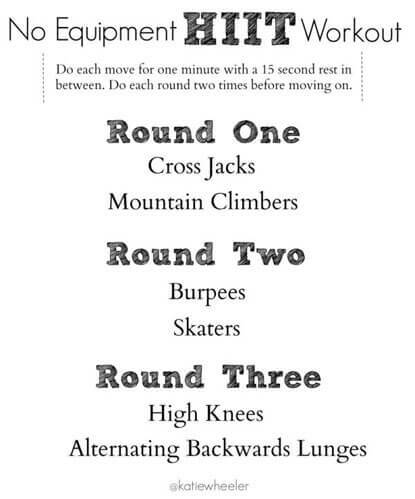 Since many of us are traveling or only have time for a short workout at home, here is a great 20 minute workout you can do without any equipment needed.